If you were to search for Creeping Charlie on the Internet you'll quickly discover that there are more websites that offer suggestions to eradicate this plant instead of eating it. This aromatic, perennial, evergreen creeper is in the mint (Lamiaceae) family. Creeping Charlie is an herbaceous plant that spreads by seed and by stolons (creeping stems). Native to Europe, it was brought to North American by the European settlers as medicine and as a ground cover. This minty edible contains a lot of vitamin C and offers a multitude of health benefits. This plant overwinters maintaining its colour under the snow. Distinguishing Features: Creeping Charlie is easily identified by its growth habit. This plant grows close to the ground and usually forms a mat-like ground cover. The long stems have nodes where the leaves grow and these nodes will form roots if they come in contact with the soil. 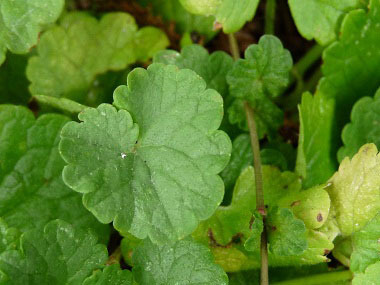 The kidney-shaped leaves tend to be shiny green and have scalloped edges. Creeping Charlie is well-noted for its rapid growth after the plant stops flowering. Being in the mint family the stem is square. Flowers: Flowers can appear as early as March in the northern hemisphere depending on location. They are purplish to blue and are quite small, about 1 cm long. Creeping Charlie flowers usually grow in clusters of three in the axils (between the stem and petiole) and are two-lipped. They have five petals, and the petals are fused into a cup or tube. Flowers grow in axillary whorls, often one-sided. Each flower produces four seeds. Fields of Nutrition has medicinal benefits and vitamin/mineral content of Creeping Charlie. Leaves: Creeping Charlie leaves produce bright, shiny green, round or kidney-shaped leaves that are broadly cordate and have scalloped margins. Sometimes the leaves may appear to be tinted purple, especially the under side. The leaf surface has sparse, short hairs. Leaves are opposite on square stems that root at the nodes. Leaf veins rise from the same point and they have palmate veins. Height: Creeping Charlie is a ground cover but can get to about 20 cm (8") tall. Habitat: Creeping Charlie prefers to grow in moist areas that include waste areas, hedgerows, shady locations, and woodland margins. It is not liked by gardeners because once it takes hold in a lawn it is hard to remove. It can grow in sunny locations as well. Creeping Charlie grows in many areas throughout Canada and the U.S. 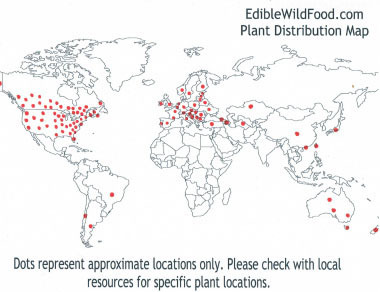 It also grows in many European countries.In Asia it grows in Azerbajan, China, Hong Kong, Georgia, Japan, Kazakhstan, Taiwan, Tajikistan and Turkey. This plant also grows in Australia (including Tasmania), and in New Zealand.In South America it is found in Argentina, Chile and Brazil. Edible parts: Young leaves can be eaten raw or cooked. The leaves have a mild mint-like flavour and can be tossed into salads to add a slight aromatic tang. 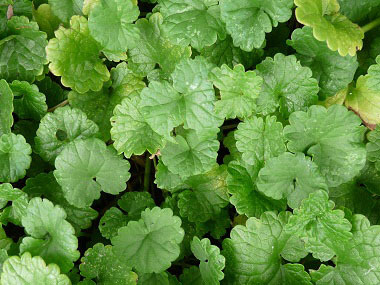 Creeping Charlie leaves can also be cooked like spinach, added to soups, stews, or omelettes. Tea is made from the fresh or dried leaves. It is often used mixed with verbena leaves or lovage. This wild edible has been added to beer in much the same way as hops in order to clear it and also to improve its flavour. For more in-depth information (e.g. nutrition, medicinal values, recipes, historical information, harvesting tips, etc.) 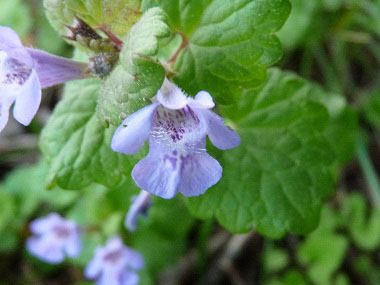 please check out our Ground Ivy PDF magazine.